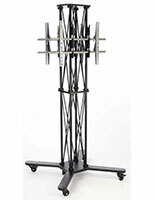 This Ready to Ship TV Stand Supports 2 Plasma Televisions or Monitors with Ease! Create Modern and Effective Advertising Presentations for Your Business! 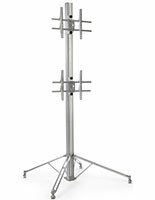 Our Company Lets Customers Know Where to Buy Bulk TV Stand Displays For Cheap! 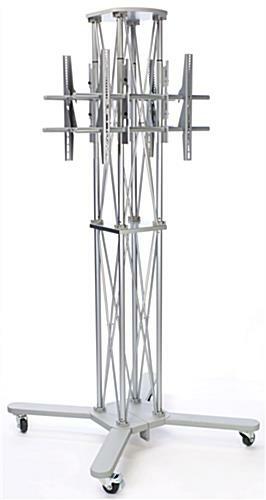 The silver TV stand, also known as a plasma display fixture, features a truss-like structure for a stylish yet user-friendly design. 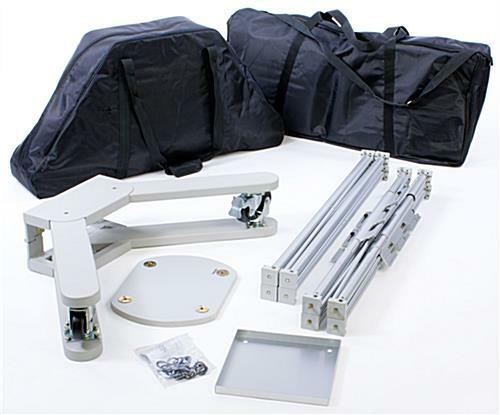 The flat screen monitor holder breaks down into a few separate parts, which enables easy travel and set up. In fact, no additional hardware is needed during assembly. 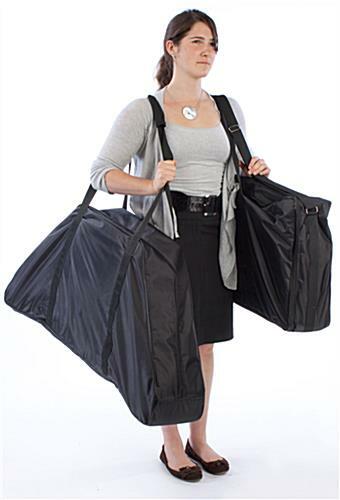 This portable TV stand stores within two compact carrying bags that are included. The freestanding LCD monitor display is made from durable aluminum and features a silver finish to blend in with any environment. 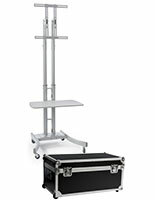 This plasma TV stand also has locking casters for easy portability to and from any location. Incorporate this flat panel monitor display into any front foyer or lobby entrance to welcome visitors with a dynamic message that is both modern and inviting. 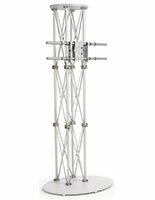 This inexpensive TV stand is capable of displaying two televisions together on one fixture. The floor-standing flat panel monitor display gives users the capability to incorporate digital advertising into a presentation in a stylish yet space-saving way. The TV stand that holds either vertical or horizontal televisions is fitted with two VESA-compatible brackets, which will match most brand-name models, including Sony®, Vizio® and NEC®. Display two 50"+ flat screens that weigh up to 80 lbs. each. 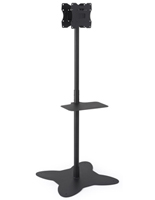 The TV stand that measures 83-1/2" tall includes two height-adjustable mounting brackets. Each monitor can be displayed as high as 69" or as low as 60". This TV stand creates a two-sided exhibit, which captures the attention of audiences from any direction. The floor-standing television display is therefore ideally meant for use during a trade show or within a hotel lobby or restaurant.